This species is considered common and widespread throughout much of the U.S. and Canada and is considered stable, or in some cases expanding, throughout its range. 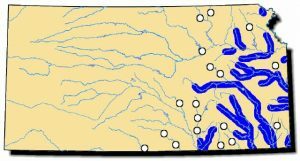 The ranges includes the coastal plain portion of Gulf drainages from the Escambia River in Florida west to Texas and northward into the Mississippi River drainage. It is also found in the Niagara River drainage in western New York. In Canada, it is restricted to the Lake Erie drainage in southern Ontario. In southern Manitoba and southeastern Saskatchewan it is widely distributed and often abundant. Comments: This thick-shelled mussel gets its name from the three prominent ridges (sometimes two or four) that are easily noticed. On older specimens, the periostracum (external layer) is worn off the umbos and they appear white. 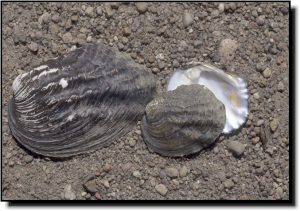 Shellers called them “old gray beards.” In some Kansas rivers, the threeridge is the most common mussel. This species does well in rivers and streams and can tolerate more pollution than other native mussels. Its glochidia are released from late spring to early summer. Threeridge shells were extensively utilized in the pearl button and cultured pearl industries due to their thickness and unblemished nacre.